"What are a mother and father to do with SEVEN rambunctious boys under the age of eleven? For the Buckleys, the days are filled with running, yelling, food, wrestling, and burping- even through family home evening. Every night culminates in an epic bedtime battle. 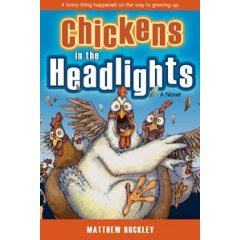 When the school year ends, however, Mom and Dad decide to harness some of their boys' apparently inexhaustible energy and buy some goats and chickens for them to take care of While they are initially thrilled with the 'responsibility,' the boys soon learn that it's far tougher - and far funnier for the reader-than it appears. If you've ever spent any time around boys, this hilarious and occasionally touching story will have you laughing 'til it hurts and fondly remembering some of your own childhood adventures." I thought it was funny, but my husband was constantly rolling on the floor laughing his guts out! He grew up with lots of boys in the family and I think it hit close to home. It was a good, CLEAN read that makes you laugh. I would highly suggest it, and we're currently reading the sequel Bullies in the Headlights.